This is a style I did on Keyanna for Labor Day 2010, a lot of my FB fans have already seen this style but I thought I would share it with those of you who haven't. 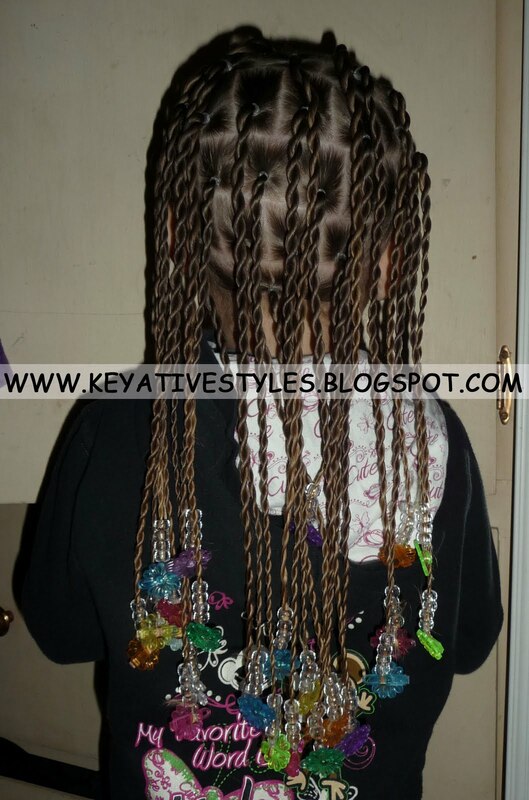 I don't do twists on Keyanna's hair very often because they don't last as long as braids, but we got a good 10 days or so out of this style. by parting her hair into rows of squares, after banding the first square I added that hair into the square behind it and banded that. 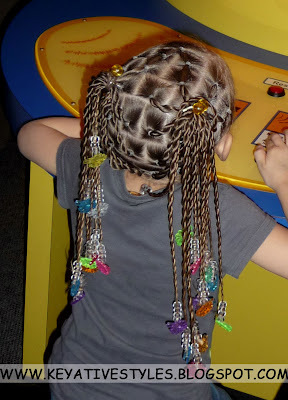 I did this for each row of squares on the top of her head. I then began working at the nape of her neck, parting a square, banding it off, twisting and then adding beads and a barrette. I continued this process until the back was finished. I love this style, her twists look great. I LOVE everything about this style but the best part is gorgeous KEY always so happy and just out right sporting her gorgeous twists! I love the bead and snap combo! Do you have to rubberband the snaps in place or do they hold with no bands? I remember your youtube video when she says "Check out my hair" and i hear "Nobody does it better..." You nailed that one Toni!!!! @Kim for this 1 I did use rubberbands to hold them.. 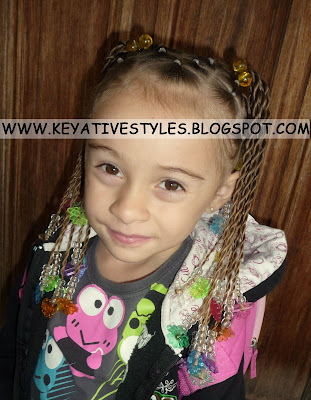 The new style I posted on facebook a few days ago (with the barrettes from curly princess boutique) I didnt have to use rubberbands, they snap a lot tighter and they stayed without them. So it just depends! Great job, as usual LOL you always amaze me! 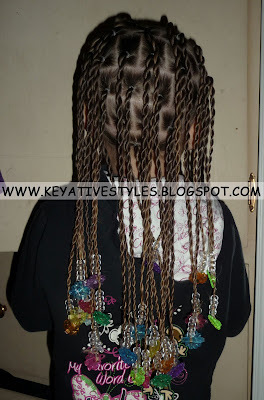 Are those 2 or 3 strand twist? 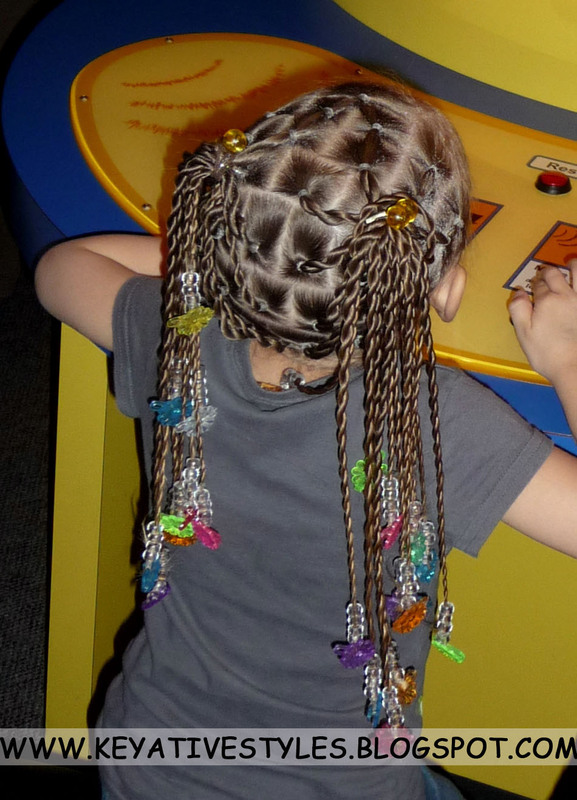 I really love the way the twists come out in her hair. Very, very cute! I remember seeing this on your page. Favorite style!